One of the easiest, most garden-worthy standard plants that you can add to your garden. Save yourself years of painstaking work by buying this ready made specimen plant - already crafted by expert nurserymen to it's lollpop shape. Easy to care for - just give an occasional light trim to maintain shape, taking particular care to remove shoots from bare stems. Save yourself years of painstaking work by buying this ready made topiary specimen - already crafted into a dramatic standard by expert nurserymen! 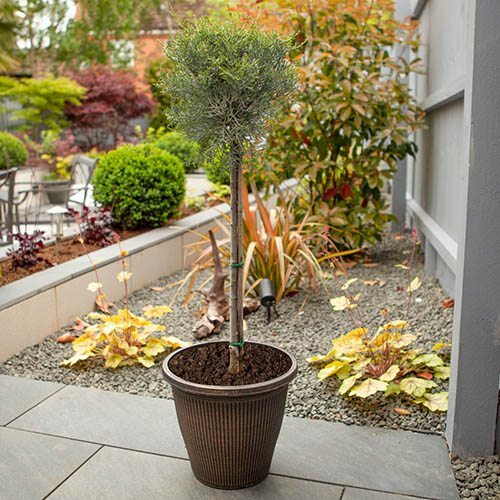 Creating a real show-stopping feature, this topiary standard cypress is the perfect plant to fill your favourite pot and place by patios, terraces or in front gardens as a centrepiece, or plant in pairs and place either side of doorways, gateways, pathways and entrances, bringing the plantsman's art to your garden to be admired for years to come. Ideal in either a sunny or lightly shaded spot, this Blue Arizona Cypress is dense and slow growing so keeps its shape well once trimmed. Easy to care for, there's really very little to do, just give its striking blue-green leaves an occasional light trim to maintain the shape, taking particular care to remove shoots from the main stem. Delivered as a mature, clipped plant 90-100cm tall (inc pot) in 10L pot. Feed regularly during growing season. Easy to care for, there's really very little to do, just give an occasional light trim to maintain the shape to your taste, taking particular care to remove shoots from the main stem.